Rule Eternia and give Skeletor a well-deserved beat-down. You have the power in Chillingo's 80s-inspired hack-and-slash effort, He-Man: The Most Powerful Game in the Universe. 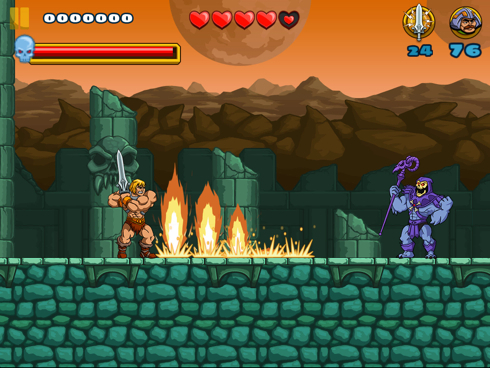 In this 2D beat-em-up, you'll guide He-Man through seven areas of Eternia teeming with Skeletor's minions. That said, you won't get very far mindlessly swiping the screen, so to give you an edge, we forged this He-Man cheats and tips guide. Aerial Smash: While airborne, He-Man will unleash a powerful downward smash on his foe. Thunder Punch: Flying minions beware! He-Man will leap into the sky and perform a powerful aerial punch. Axe Throw: Equip He-Man with his signature battle axe and damage enemies from afar. Power Slice: Charge and parry enemy projectiles while in the power stance. Charge to unleash a powerful sword swing. The Most Powerful Game in the Universe is significantly easier if you purchase tokens. The first, Power of Grayskull, grants He-Man temporary invincibility that lets you avoid damage and charge through baddies. The other, Summon, causes He-Man ally Man-At-Arms to appear and blast enemies with his pulse cannon. Always great to have a few on hand, especially during boss fights. Supercharge He-Man's moves and make him stronger with upgrades. These run the proverbial gamut, from destroying tough blocks to improving He-Man's health by one heart container. Don't hesitate to break stone pillars and platforms. Not only will you receive Crystals for your efforts, but debris also damages nearby enemies, which makes slaying these fools a heck of a lot easier. As you explore Eternia, you'll happen upon orange letter H's known as Lore Tokens. Collecting these icons unlock bonuses, like character bios, comic book covers and concept art. Obviously, some are tougher to find than others, so make sure you cover every square inch. On that note, double jumping is a great way to find them all. You can always head back to previously completed stages to improve your overall rating, score and number of Crystals. Sick of replaying levels for a modest number of Crystals? Get more the easy way.